Ok so today I will be looking at Mark Miller’s comic “Pirouette”. It’s got some crazy circus stuff on the cover and some decent art so let’s follow this rabbit hole to wonderland and see where we end up! (Reader note: This is an excessively graphic comic and if you are squeamish don’t read it). The art is terribly dark but it fits with the theme and the paneling really furthers that tone. That being said, the art is fantastic, rivaling some of the best work I’ve seen in the industry. There is exquisite details and the artist really knows how to stick to his chosen color pallet. Each character is visually distinct and memorable. Of note, is that this comic has a really high production value. Someone REALLY dug this comic so my hat (or maybe mask?) is off to publisher Black Mask for their superb quality and care. Something I always like is good typography and page 1 we have some very interesting use of lettering. It comes in the form of a retro “headline” style display (where many bulbs are used to form letters) that spells the comic’s name and has a few burnt out and smoking bulbs at the end. 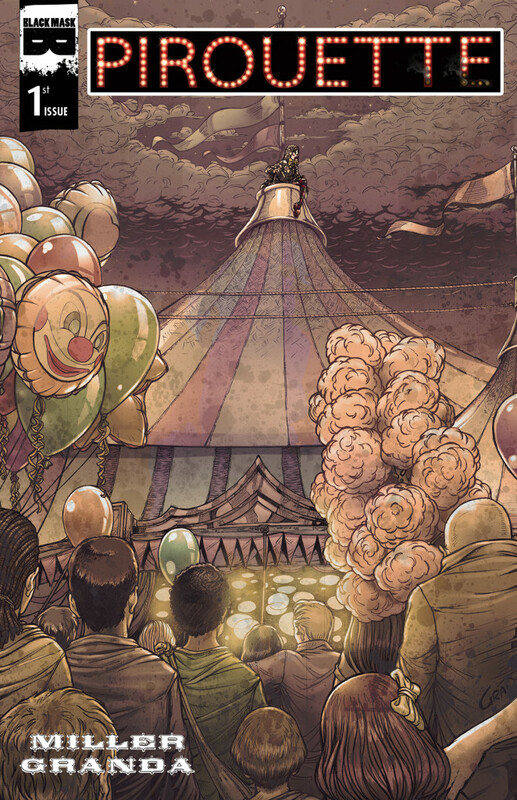 This sets up the comic to draw a lot from circus mystique and have a darker undertone. I gotta say, I absolutely hate the full page spread panels on this comic. It really ruins the flow and sometimes I really wished they’d relegated certain parts to smaller panels (even the establishing shots). I love the choice of lettering, it’s very expressive while still being legible. Sometimes it makes the text (particularly on e-readers) look very very small and difficult to read. The tone is very dark and the plot is equally so. In the very broad strokes, it’s about a young female clown who has a rough life in the circus and we get to see all the pain she suffers. The characters are memorable, if only visually, and you kind of see everything coming. Nothing that is going to blow your mind but as far as stories go, it is a very human one. The writer has a great grasp of tone and metaphor but sometimes is a little too on the head. The dialogue is well written and intertwines a lot of colloquialisms well. Again, a few stick out as odd or out of place but on the whole they work well. They do passable on the humor aspect but it really feels like this comic’s strength comes from it’s believable (if not decidedly dark) characters. The plot of the first issue didn’t really do anything for me and the hook at the end kind of made me shrug. It does seem like it is going somewhere but not somewhere I am really, personally, interested in. Overall, it’s a comic that is exactly what you see on the label. It is a dark comic about circus life and if that’s your cup of tea (read the comic…that’s a funny joke) you will enjoy it. Comes for the art and stay for the elephant poop and clowns. This entry was posted in Comic Reviews and tagged black mask publishing, Carlos Granda, comic, comic review, comics, independent comics, indie comic review, issue #1, Mark Miller, new comic, PIROUETTE, scott gladstein, scottyg. Bookmark the permalink.